We are giving Glaswegians the chance to walk inside a giant inflatable bowel when it returns to the city on Saturday 7 April from 10:30am – 3:30pm on Argyle Street to mark Bowel Cancer Awareness Month. Building on the success of last year, the giant inflatable bowel – measuring 19 feet by six feet – is an interactive way to demonstrate the various stages of bowel cancer and other diseases of the large intestine, and raise awareness of bowel cancer symptoms and screening. It’s also a chance to ask our staff and volunteers any questions about the disease, as well as get a tour of the bowel, take selfies and pick up free fruit. 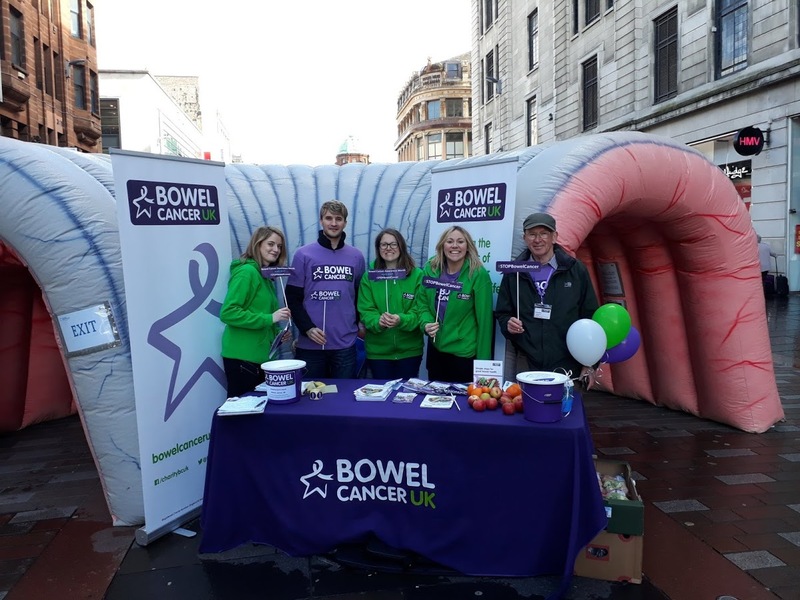 Claire Donaghy, Head of Scotland at Bowel Cancer UK and Beating Bowel Cancer, says: “It’s not every day that you have the opportunity to get ‘up close and personal’ with a giant inflatable bowel, but we hope this is a fun way to break the ice and get people talking about bowel cancer.